Since 1984 (I understand) there has been a peripatetic seminar series shared between the medievalists of the universities of Chester, Keele, Lancaster, Liverpool, Manchester and Manchester Metropolitan Universities (presumably not all of those initially), which is now known as the M6 North-West Medieval Seminar, because of the six participant medieval departments and also the arterial road that links the north-west of Britain to its neighbouring regions. The papers often look really interesting, but from Cambridge or Oxford I could never have got back from it before the transport ran out for the night, and it wasn’t till 12th November 2014, when the seminar swung down to its southernmost point at Keele, that I could even attempt it from Birmingham. Even then it was a bit of an adventure, with a forty-minute bus ride through the dark from the nearest station and so on. There was a certain amount of surprise to see me! But I did, at last, make it to the M6 Seminar, and the blog backlog now crunches round to reporting on it. There were two papers, and they were “Medical Practitioners before Medical Schools: the evidence from Salernitan charters, ss. VIII-XI”, by Luca Larpi, and “Lords of the North Sea: comparative approaches to the aristocracies of the tenth and eleventh centuries” by Anthony Mansfield. And here is a medieval image of that school! “ScuolaMedicaMiniatura“. Licensed under Public Domain via Wikimedia Commons. Mr Mansfield’s paper, which came from his ongoing doctoral research, was more dogmatic, demanding that we try to stop seeing regional aristocracies as loyal, grudging or rebellious with respect to the centre and instead view their political choices in the context of their regions. The regions he picked for this were Essex in England, Guines in Flanders and Trøndelag in Norway, all of which areas he noted were delimited by water although as he was forced to admit in questions, some of those waters were pretty easy to cross; in one case one could jump it, though my notes annoyingly don’t name it. In all these places, argued Mr Mansfield, our texts show us the existence of a regional identity which must always have been those places’ lords’ first concern, because without support within the region they could do nothing, whether helpful to the centralising court or not. Much of the thinking here emerged in questions, and I imagine thateven by now the project is much further on, but for early work it was demandingly theorised and I suppose that many of the questions came from a feeling that evidence would probably bend the theory once there was enough of it in play. The obligatory Catalan counter-example, the Castell de Cabrera in Santa María de Corcó, Osona, where an outsider lineage very happily ruled an area with no clear identity beyond its name, though that’s not to say there wasn’t one. Photo by Ricardo Ballo. 1. The publication of the charters of Cava is an ongoing effort with a long and painful history. There is Michele Morcaldi, Mauro Schianni & Silvano Di Stephano (edd. ), Codex Diplomaticus Cavensis (Napoli & Milano, 1873-1970), 10 vols, but I gather that this is only about two-thirds of what there is and that work on the remainder since 1970 has met many difficulties. 2. This does, admittedly, from a literature search look like something that is mainly known by those writing in Italian. An introduction for others might be Paul Oskar Kristeller, “The school of Salerno: its development and its contribution to the history of learning” in his Studies in Renaissance Thought and Letters, Storia e letteratura: Raccolta di studi e testi 54, 166, 178 & 193 (Roma, 1956-1996) 4 vols, III pp. 495-551. 3. 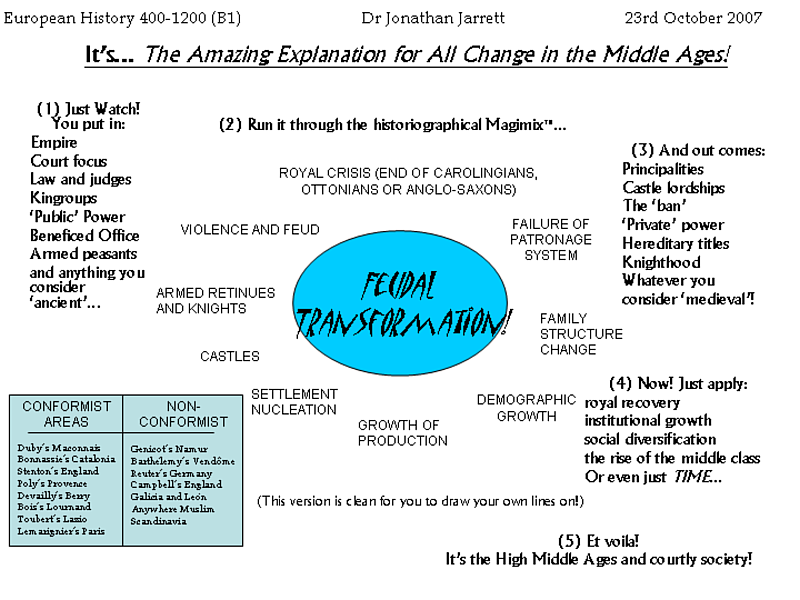 Jonathan Jarrett, Rulers and Ruled in Frontier Catalonia 880-1010: pathways of power (Woodbridge 2010), pp. 144-148. Sorry, this has taken a couple of days to find the time to write. But, as with the conference experience itself, the only way out of the backlog is through! Or something. So, resuming the Leeds 2013 report on Tuesday 2nd July, your blogger found himself breakfast (which was reassuringly, basically the same as it had been at Bodington, which is to say, there were many options healthier than the somewhat limp fry-up but that’s what I always have anyway). Thus fortified, I headed for dispute! Lastly, Warren Brown, as is his wont, emphasised that for the early Middle Ages, formulae are in some ways a richer source for social practice than land transfer documents and showed it by extracting from them information on judicial process in disputes between laymen, something that given most surviving documents’ involvement of the Church we otherwise hardly see; this shows up, even in Frankish sources, a picture of negotiation, settlements, tactical defaults, oaths and corruption that looks a lot more like the picture we have from the more detailed Italian evidence, although also a significant amount more homicide and highway robbery than we find in any other sources.1 He also emphasised that women were envisaged as aggressors too, not just by underhand means like sorcery but sometimes by flat-out assault. His conclusion was that the formulae show the patches that had to be applied to a system that often went wrong, which I think is pretty realistic. I must have slipped! So after that obviously stern strictures were required, in the form of law. Mr Bothe, meanwhile, approached the question of death for thieves, something that is supposed often to be normal ‘barbarian’ practice, especially for those caught in the act, but which is often deprecated in the actual laws in favour of heavy fines, which he suggested were preferred because of not implicating the judiciary in the feud that might result from executing someone. I thought that that, and the idea of a legislating state trying to patch up law, both sat oddly next to the idea we seem otherwise to be developing of Merovingian Frankish law as a more or less decentralised set of ideals, something on which I’ve heard enough since to make it impossible for me to recover what I thought about this session at the time. That picture was much more present in Mr Ridder’s study of the Laws of the Bavarians, though, a text whose origin and issuer is almost perfectly unclear, but which attributed to the king of the Franks considerable connections to and authority over the Agilolfing dukes of the Bavarians. Mr Ridder suggested that here we might even take the text seriously and associate it with a Merovingian move into the duchy to coordinate its defence against the Avars. The questions mainly focused on Mr Bothe’s fines, however, and whether, given their size, even they were supposed to be more than deterrents; he thought that probably was their function, but pointed out that what seems to be an impossibly large amount of gold might still be achievable in cattle, because cows were surprisingly expensive (say two solidi each? ), or of course in land, which, as in Spain (why I’d raised the question) was not envisioned in the law but certainly happened here. Here again, therefore, we saw that the actual law texts bear only the sketchiest relation to what was actually done, meaning that they were not the kind of resource we usually think they were. How many other sorts of text does that apply to, we might ask? Then coffee and then fireworks, at least of an intellectual kind. The eventual home of the monks of St Philibert, at Tournus. “Tournus-StPhilib” by Morburre – Own work. Licensed under CC BY-SA 3.0 via Wikimedia Commons. Lastly, Charles Insley took aim at the developing historiography, of which you’ve had plenty reported here since it’s largely coming from Oxford, that is trying to place the definitive development of an English state in the tenth century. He pointed out that by using Koziol-like tactics of analysing the uptake and issue of royal diplomas, it seems clear that large parts of this supposed kingdom just did not deal with the kings in the way that the south did.5 Instead, therefore, he suggested that far less of tenth-century England was governed by consent, as opposed to grudging acceptance of the king’s ability to beat them up with southern armies, and that governmental structures may therefore not be enough to tell us about unity. Most of the questions Charles got were about preservation: there has been so much Anglo-Saxon material lost that arguing from areas of absence is dangerous, but, as he says, there are lots of charters from East Anglia, just no royal ones, and there aren’t no documents from the north (though it’s very close!) so there is still something to explain.6 Julie Hofmann suggested that we might be looking less at obedience to royal power projection in the tenth century and more at subservient submission to royal dissolution in the sixteenth, which as Charles said is a possibility that late medieval registers might help eliminate. Work to be done, therefore! All the same, this session hit a great many of my buttons: three scholars I think are always interesting and argumentative, all pushing more or less big ideas, and happy to let others take shots at them in the cause of testing them out, with plenty of people happy to do so; it may look quite disputational, and I suppose it isn’t for the thin-skinned, but in a session like this one can practically feel the field energise and take shaky steps forward. There was plenty to think about over dinner. But then there was also some more to think about after dinner, in the form of a dessert of databases. This took the form of two short presentations of the respective projects by their principal investigators, introduced by Jinty Nelson, with a question and answer section for each. I’ve yet to see a round table at Leeds that really is a round table, though I do generally avoid them which is probably why, but nonetheless there was lots of information here. Nomen et Gens is a project that’s been running since the 1970s—as Steffen Patzold who was introducing it said, long enough to have its own Traditionskern—but has lately advanced fully into the database age, and its aim is to amass enough prosopographical data to assess quantitatively what ethnic identifiers actually meant to their early medieval users.7 What this means, however, is that it now contains basic biographical and personal information for 10,000-plus people of the seventh and eighth centuries and the easiest way to find out more is to go and look, here. The only real question was why this was only a demo version, but apparently there is much more to check and unify before the full thing can go live to the world. Accounts are available for those who can help, though. Alice Rio spoke for The Making of Charlemagne’s Europe, a project I’ve heard a lot about given its staff’s frequent presence at the Institute of Historical Research. Here the aim has been to database all the charters from the reign of Charlemagne and the territories which he ruled. A lot has been learned from the approaches used at Kings College London, where the project lives, on Prosopography of the Domesday Elite, and its structure is quite sophisticated. Here, again, the best way to find out more is probably to go and play with it: it wasn’t live in July 2013 but now it more or less is, so take your Charlemagne-period enquiries to it and see what it has to tell you! At this point it was still very much in development: I asked, for example, if it could answer stacked queries (a query performed on the results of a previous query) and was told that it had been able to since two o’clock that afternoon… But it was clearly going places at last, after many frustrations, and the two databases were also probably going to be able to talk to each other behind the scenes in productive ways. 1. W. C. Brown, “Conflict, letters, and personal relationships in the Carolingian formula collections” in The Law and History Review Vol. 25 (Cambridge 2007), pp. 323-44; cf. Chris Wickham, “Land Disputes and their Social Framework in Lombard-Carolingian Italy, 700-900” in Wendy Davies & Paul Fouracre (edd. ), The Settlement of Disputes in Early Medieval Europe (Cambridge 1986), pp. 105-124, rev. in Wickham, Land and Power: studies in Italian and European social history, 400-1200 (London 1994), pp. 229-256. 2. Eckhardt did about a hundred different editions of the Lex Salica but I guess that the definitive ones are the MGH ones, K.-A. Eckhardt (ed. ), Pactus Legis Salicae, Monumenta Germaniae Historica (Leges Nationum Germanicum) IV.1 (Hannover 1962), online here, and idem (ed. ), Lex Salica, MGH Leges IV.2 (Hannover 1969), online here. The problems of assuming an Urtext behind the manuscripts of course also dog attempts to come up with a single translation, such as Katherine Fischer Drew (transl. ), The Laws of the Salian Franks (Philadelphia 1991), where pp. 52-55 demonstrate the awkward choices that had to be made. 3. That being none other than Geoffrey Koziol, The Politics of Memory and Identity in Carolingian Royal Diplomas, Utrecht Studies in Medieval Literacy 19 (Turnhout 2012). 4. The last word on the monks of Saint Philibert appears now to be Isabelle Cartron, Les pérégrinations de Saint-Philibert – Genèse d’un réseau monastique dans la société carolingienne (Rennes 2009), which Professor Koziol cited. 5. Referring to Koziol, Politics of Memory, in case that’s not clear, though cf. Mark Mersiowsky, “Towards a Reappraisal of Carolingian Sovereign Charters” in Karl Heidecker (ed. ), Charters and the Use of the Written Word in Medieval Society, Utrecht Studies in Medieval Literacy 5 (Turnhout 2000), pp. 15-25! 6. What there is from the north is now printed in David Woodman (ed. ), Charters of Northern Houses, Anglo-Saxon Charters 16 (Oxford 2012). The need to catch up on the seminar reports is still fairly urgent, so I must do my now-usual filtering of what is in the pile. Out, with reluctance because it was good but with reassurance because as so often Magistra has already covered it, goes the second Clerical Cosmos conference in Oxford, but do go have a look at Magistra’s reports if the subtitle, “Ecclesiastical power, culture and society, c. 900 to c. 1075″, sounds like it should hit your interests. That at last takes me into the Easter term of 2013, and that term was greeted in Oxford by a paper by Mark Whittow to the Medieval History Seminar on the 23rd April entitled, “Territorial Lordship and Regional Power in the Age of Gregorian Reform: Matilda of Canossa and the Matildine lands”. This paper did the audience the good service of recapitulating Matilda’s career, something it’s quite hard to get in one place from literature outside Italy despite its importance in the politics of Germany and Italy (and especially both) in the time of the eleventh-century dispute of Holy Roman Empire and Papacy, and assessing her landed holdings.1 Out of this came several observations, one being that little enough of her focus was actually in her marquisate of Tuscany, where competition for power was perhaps not one-sided enough, and another being that while she is often represented as a champion of public office because she held one, her armies were formed of vassals based in castles even if the emperor had approved the grant of the castles. In other words, she was pretty much as feudo-vassalitic in operation as the Dukes of Aquitaine, even if she was more closely involved with a persistent and intermittently-powerful royalty than they were. Nonetheless, there was a difference in the discourse of power Matilda used, with artwork and manuscripts presenting her as imperially-descended and legitimate and traditional in a way the Meridional princes wouldn’t have used unless they went for Roman roots, as Christian Lauranson-Rosaz would argue they did in the Auvergne.2 That, at least, would have worked to undermine the claims of a royalty that drew its ancestry back to fairly recent, and certainly post-Roman, times, but Matilda was competing for the same grounds of legitimacy as her German royal opponents (and sometimes allies). So this was all very interesting and fitted Matilda into a different framework than the one where English-language historians usually meet her, but the thing that sticks with me is something that I had to raise in questions, that the pictures we have of her do, yes, twice show her on a throne, but they also consistently show her dwarfed by it, compared to her noble antecessors shown on the same throne in the same manuscript. The author of that manuscript knew the lady personally; it was hard not to conclude that the artist did too, and what he or she knew was that their patron was pretty small.3 This obviously didn’t make her any the less considerable, if so! Then the very next day the Medieval Church and Culture Seminar was lucky enough, as we were told at fulsome length, to be host to Professor Paul Hyams, who spoke with the title, “Disputes and How to Avoid Them: charters and custom in England during the long 12th century”.4 This appealed to me, predictably perhaps, as it was a paper about what the charters aren’t telling us, the trouble that a dispute settlement charter averts or that preceded its issue but which its scribe thought it impolitic to recount, at least from more than one side. It dealt with the invisible threshold of wealth beyond which written records were even available, specifically, and whether we can see serfdom in medieval England as early as it may start. I wouldn’t like to say that it concluded that we could, but the plea to consider what else was going on around the documents we have – the meetings, to and fro voyages of negotiation, the feast and the talk at dinner when a transaction was concluded, all of which probably explain a lot more about how a given transaction unfolded than does its surviving record – is a plea always worth hearing, especially when loaded with this many interesting examples. 1. The core text here is a Vita Mathildis by one Donizone of Canossa, whence we get the charming picture, the text most recently edited and translated (into Italian; I’m fairly sure there’s no English translation) by Paolo Golinelli as Vita di Matilde di Canossa (Milano 2008); the secondary work that Mark cited included Golinelli (ed. ), I poteri dei Canossa da Reggio Emilia all’Europa. Atti del convegno internazionale di studi (Reggio Emilia – Carpineti, 29-31 ottobre 1992) (Bologna 1994), especially Guiseppe Sergi’s “I poteri di Canossa: poteri delegati, poteri feudali, poteri signorili”, pp. 29-39, and Sergi, I confini del potere: Marche e signorie fra due regni medievali (Torino 1995); on the dispute between empire and papacy in which Matilda became so involved, I like Ute-Renate Blumenthal’s The Investiture Controversy: Church and monarchy from the ninth to the twelfth century (Philadelphia 1988). 2. For example, C. Lauranson-Rosaz, “La romanité du midi de l’an mil (le point sur les sociétés méridionales)” in Robert Delort (ed. ), La France de l’An Mil, Points-Histoires H130 (Paris 1990), pp. 49-74, rev. as “La romanité du midi de l’an mil : le point sur les sociétés méridionales” in Xavier Barral i Altet, Dominique Iogna-Prat, Anscari Mundó, Josep María Salrach & Michel Zimmermann (edd. ), Catalunya i França Meridional a l’Entorn de l’Any Mil: la Catalogne et la France méridionale autour de l’an mil. Colloque International D. N. R. S.[sic]/Generalitat de Catalunya « Hugues Capet 987-1987. La France de l’An Mil », Barcelona 2 — 5 juliol 1987, Actes de Congresos 2 (Barcelona 1991), pp. 45-58. 3. The manuscript is Vatican City, Biblioteca vaticana, MS 4922, and is edited in facsimile as Donizone di Canossa, La vita di Matilde di Canossa: Codice Vaticano latino 4922, ed. Golinelli, Codices e Vaticanis selecti 62 (Milano 1984). A few more bits of it are online here. Last one in the current run of Institute of Historical Research Earlier Middle Ages Seminars was on the 5th December, with Tom Brown of Edinburgh, speaking on “Life after Byzantium: Ravenna and its hinterland in the Carolingian and Ottonian periods”. I think I’ve seen Tom present at the IHR more times than I’ve actually read an instance of his work, and this is in some ways very wrong as his stuff is without fail interesting and entertainingly delivered, but on the other hand his presentations are always work in progress so they have a more human quality than perhaps the dry academic printed word needs. On this occasion he was mainly arguing that Ravenna, although never equal to its fifth- and sixth-century glory days as the Western capital of the Roman Empire, was very far from being a backwater, even once deprived of a coastline, and remained one of the most important and high-status cities in the area until the definitive eclipse by Venice in the twelfth century.